We bring forth the finest quality Spray Popup in the market. The Fixed Spray Popup offered by us is Available in 90Â°, 180Â°, 270Â°, 360Â° fixed spray patterns low as well as high discharge rate. It is also designed for providing nozzle flow adjustment. Further, we are reckoned as one of the distinguished Lawn Care Spray Popup Manufacturers in India. Female threaded precise spray nozzles made of UV stabilized High Impact ABS Engineering Plastics. Available in 90Â°, 180Â°, 270Â°, 360Â° fixed spray patterns having low as well as high discharge rates. Also available variable arc Nozzles. Designed to provide nozzle flow adjustment. Also available pop up fogger and bubbler. Available in 2â�� and 4â��, 6â�� and 12â�� (with side in let) pop up stroke lengths. Â½â�� BSP Bottom Inlet is standard in all models. Specially designed wiper seal made of good quality synthetic rubber. Protects piston from and debris. Holds retract spring in place. Provide with stainless steel arc adjusting screw for ease or arc adjustment. Buttress threaded cap are provided for firm holding of cap of the body against high water pressures. Large threads prevent cross threading during fitment. Filter screen made of good quality Engineering Plastics having large filtration area of prevent any debris from entering the nozzle so as to give good quality and reliable spray pattern. Corrosion resistant Stainless Steel retract spring insures a positive retraction of the piston during close down of water supply. Ratchet adjustment provided for easy alignment of the spray pattern in the field. Made of good quality wear resistant plastic materials to ensure a long operational life. 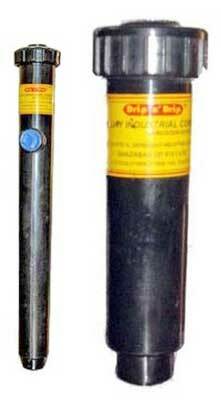 All models are provided with anti drain valve to eliminate lowhead drainage & puddling.